Betty Joyce Martin, 82, of Nauvoo, passed away at 4:40 a.m. Saturday, June 9, 2018 at OSF Hospital in Peoria. Born May 25, 1936 at Fort Madison, Iowa, the daughter of Joyce and Anita Bertschi Gerhardt. On July 15, 1956 at the Appanoose Faith Presbyterian Church in Niota, Illinois she married Lester P. Martin. Survivors include her husband Lester of Nauvoo, Illinois. Children: Susan (John) Wegrzyn of Franklin, Tennessee, Sharon (Kelly) Scott of Lancaster, Kentucky, Steve (Sheryl) Martin of Nauvoo, Illinois, Scott (Lori) Martin of Pekin, Illinois. Grandchildren Brenna (Joey) Chandler, Brian (Ashley) Bjork, Ben (Rachel) Bjork, Lindsey (Fiance Jarad Northern) Scott and Stephen (special friend Sarah DiPrima) Martin. Also surviving are ten great grandchildren and the family dog Rutledge. Betty was a 1954 graduate of Nauvoo High School, attended Gem City College, Monmouth College, and was accepted into the music program at Julliard. Betty was a member of the Nauvoo Presbyterian Church where she served as organist for over 35 years. She worked as a switchboard operator, legal secretary, sales rep. and bookkeeper. 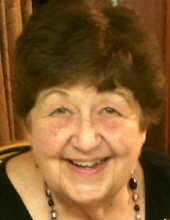 She owned and operated Martin’s Accounting and Tax Services for over 40 years. She served as Treasurer of the Nauvoo Betterment Association and the Nauvoo Senior Citizens. She was an Election Judge and Trustee of Appanoose Township, was a member of the Daughters of the American Revolution, the Business and Professional Women, and the Nauvoo Chamber of Commerce. She was preceded in death by her parents, daughter Sheila, and sister Lois Knoche. Friends may call after 1:00 p.m. Tuesday, June 12, 2018 at the Nauvoo United Methodist Church where the family will meet with friends from 4:00 p.m. to 7:00 p.m.
Funeral Services will be held at 10:00 p.m. Wednesday, June 13, 2018 at the Nauvoo United Methodist Church with Pastors Mark Anderson and Mark Lowman officiating. Burial will be in the Nauvoo City Cemetery. Memorials may be made to the Nauvoo Presbyterian Church or M.G (Myasthenia Gravis) foundation. Schmitz-Banks and Beals Funeral Home of Nauvoo is assisting the family with arrangements. Online condolences may be made to the family at www.sbbfuneralhome.com. To plant a tree in memory of Betty Joyce Martin, please visit our Tribute Store. "Email Address" would like to share the life celebration of Betty Joyce Martin. Click on the "link" to go to share a favorite memory or leave a condolence message for the family.